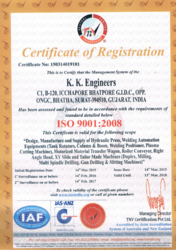 We are a quality conscious organization and committed to offer superior range of Welding Automation Equipment, Material Transfer Equipment, Hydraulic Presses & Systems and Special Purpose Machines (SPM), Tank Rotator, Positioners, Custom Built Machines in Welding Automation to our clients. Our quality testers are well experienced and fully qualified to check the quality of the product from its initial stage to till its final product. We never compromise on quality of product. These are tested with various quality measures and ensures before sending it to the clients. Client satisfaction is given highest priority by our organization. Our products are made under the supervision of our experts and using advanced technology. These products are available in various specifications, which can be customized as per the requirement of our clients. Our products are well known for high quality, durability, high efficiency, low maintenance and longer functional life. We maintain a perfect relationship with the customer to improve our productivity based on customer satisfaction.